Supreme Court EPA Clean Air challenge: Mercury standards cost too much, coal industry says. What Should Clean Air Cost? The Supreme Court’s surprising decision to hear a challenge by big coal. Defenders of the EPA regulations argue that for each year these Mercury and Air Toxics Standards are in place, they should prevent up to 11,000 premature deaths, 4,700 nonfatal heart attacks, and as many as 540,000 days of work lost to asthma and other respiratory illnesses. 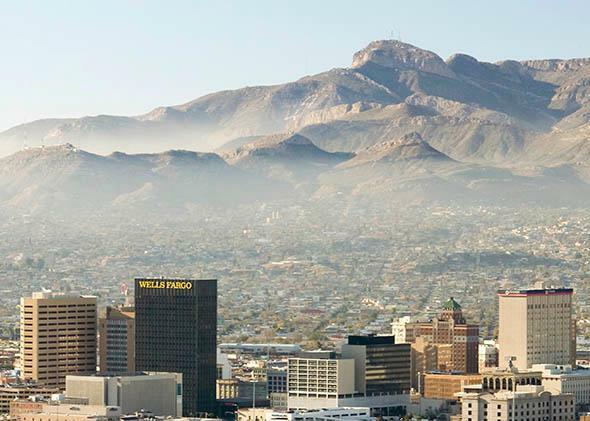 Above, the El Paso, Texas, skyline in 2006. In a way, Wednesday’s Supreme Court case about the EPA’s new mercury legislation is another paradigmatic “Obama’s War on [Insert Name]” challenge. In this case, the president is being blamed for shameless overreach in an unjust “War on Coal”—even though the Clean Air Act, at issue in the challenge, dates back to the days when Obama was just mastering his two-wheeler, and the EPA’s reading of the act feels less warlike than workmanlike. Congress passed the Clean Air Act in 1970 and after a good deal of lollygagging and foot-dragging, amended it in 1990 to more aggressively target more than 180 hazardous substances including arsenic, mercury, and various toxic gases. If these substances were shown to harm human health, according to the rule, the Environmental Protection Agency “shall regulate” the major sources of these pollutants where it is “appropriate and necessary.” After studying the issue a lot, the EPA twice put forth new regulations it believed to be “appropriate and necessary” for coal and oil-fired power plants to curb the spread of mercury and other hazardous chemicals, first in 2000 and then again in 2012. (The Bush administration tried unsuccessfully to undo all this in 2005 but failed in federal court.) The challengers in this case argue, in short, that the EPA didn’t properly take costs into account when the agency created its Mercury and Air Toxics Standards, which set emissions standards for about 600 electric power plants across the nation. The EPA has concluded that mercury pollution from coal-fired steam electric plants may be making fish unsafe for human consumption in 65 percent of the waters that receive discharges. Mercury is far and away the leading cause for EPA and states to issue more than 4,000 fish-consumption advisories, warning fishers “do not eat” or “limit consumption” of some or all fish from over 40 percent of lake acres and river miles and most of the continental U.S. coastline. The health scientists go on to add that adults with methylmercury poisoning have had severe and debilitating symptoms: paresthesia, ataxia, weakness, vision and hearing impairment, muscle tremor and spasticity, and even coma or death. Mercury is particularly dangerous to developing fetuses, so it’s important for pregnant women or women who may want to become pregnant to avoid it. The government estimates that 7 percent of women of childbearing age are exposed to excessive mercury emissions. The government sets the cost of premature deaths and brain damage at somewhere between $37 billion to $90 billion a year. And, although such things are tricky to quantify, the defenders of the regulations argue that for each year these Mercury and Air Toxics Standards are in place, they should prevent up to 11,000 premature deaths, 4,700 nonfatal heart attacks, and as many as 540,000 days of work lost to asthma and other respiratory illnesses. An amicus brief filed by the National Congress of American Indians also states that some American Indians consume fish at rates four or five times higher than the average American, putting them at even greater risk. The science around mercury poisoning is not really in dispute in this case, although the industry proponents do like to take potshots at the EPA numbers, and some of them describe the health hazards as minimal. But really, it is hard to argue with decades of serious, peer-reviewed science. The impact will be felt mainly in the Southern and Midwestern states that depend more heavily on coal power. That explains why the challengers here are the state of Michigan and 20 other (mainly Republican-led) states, which contend that the EPA should have calculated the future compliance costs much earlier, as part of the threshold inquiry into whether it was “appropriate and necessary” to regulate power plants. The federal government (along with 17, mostly Democratic-led states) and its supporters contend that “appropriate and necessary” mean, among other things, what the dictionary says they mean and that appropriate regulation does not involve a mandatory, upfront cost assessment. They add that 61 percent of the power-generating units across the country have already met the standards. Nobody expected the Supreme Court to take this case. It had been decided in favor of the EPA by a 2–1 margin last spring, in the Court of Appeals for the D.C. Circuit. The fact that 20-plus states filed an appeal may have something to do with the Supreme Court’s surprising willingness to hear this case. And in the wake of a slightly mixed record for the EPA last term at the court—it scored a big win in one case and a split decision that arguably gave the EPA everything it wanted in another—there is some cause to worry that the right-tilting, business-friendly bench took this case to bonk the Obama administration on the nose again for big-government overreach. Reading the amicus briefs is enough to make you swear off fish for a lifetime. Sean H. Donahue, who is counsel of record on the respondent’s brief filed by the American Academy of Pediatrics along with other organizations including the American Lung Association and American Nurses Association, notes that back when the regulations were passed, industry supporters “were glad Congress put in these provisions because they were based on science,” and at the time, the science wasn’t as damaging for industry as it is today.” Adds Donahue: “50 states have warnings that if you are pregnant you should not eat the fish.” In which case, the only thing the industry can now argue is that the costs should have been considered earlier in the process; it can’t really claim that the public health benefits are not extraordinarily compelling. Should the EPA lose this time, the agency may be able to go back and rejigger the cost–benefit fight in ways that would satisfy the court. Generally, the rule for the Supreme Court should be that it reads the word “appropriate” with great deference to reasonable interpretations by an agency of its own statutory language. In that sense, this might be an easy case. But when it comes to allegations of Obama and massive overreach, well, this could be a closer case than ordinary judicial deference might allow. For 90 minutes on Wednesday, the Court will thus do another round in what seems an endless array of cases that may as well just be called Obama’s Legacy v. the Roberts Court.